Why do puppies have to be so adorable?? They win our hearts often from the first time we meet them. Giving us those puppy dog eyes, and don’t forget the puppy breath! Far to often people take that puppy home without truly thinking through the huge undertaking that goes with it. Puppies are work, hard work. You have this little eating, chewing, pooping machine that has no idea how to live in our world. While they may be calm today, tomorrow they may be surfing your counters, and chewing on your furniture, using your new rug as a spot to relieve themselves. They don’t stay cute little fuzz balls for long as they grow quickly and need to be taught how it works living with us. While you may be dreaming of how wonderful it would be for your family to have a puppy. Sometimes it almost goes hand in hand, the vision of getting the kids a dog to grow up with. While I personally feel all kids should learn about how to take care of a dog, you must know the majority of care falls upon the parents. It really should, if you want your dog to be well behaved. Many parents put the task of the dog on the kids and what happens is the dog suffers, which in turn the family suffers. Puppies learn 24/7 whether it be good or bad, they are always learning, watching and associating your behaviors. You see dogs are extremely consistent while we as humans are highly inconsistent. What dogs often learn is they need to “fill in the blanks” in order to figure out how to act. Often by the time you realize what has happened the dog has formed many undesirable behaviors. You need to consider your schedule and make sure someone is available to take care of the new puppy. You see puppies cannot fully control their bladder until about 4-5 months old. So that means they will usually have to go about every 3 hours during the day. They usually don’t sleep through the night until around 12-13 weeks old as well. A puppy has tons of energy and also loves to sleep. They play hard, and sleep hard. The mistake many make is getting a puppy and thinking it can just hang out in the crate all day. Let me give you scenario that many think will work (hint…it doesn’t). Some figure that they can put the puppy out before they leave for work at 8 a.m., then come home for lunch around noon and let the puppy out again, put the puppy back in the crate and come home at 5 p.m. and the puppy is good! Others will sometimes have a dog walker come another time in that time frame to let the puppy out. This scenario may work for the first week, but after that it is going to turn bad fast. What happens is something called “LIFE”. As the puppy grows they will sleep less, needing more attention. You will come home, open the crate door and have a puppy that has so much energy when you are wanting to wind down a bit from work. That once cute adorable puppy has become a chore. You will want to sit down, have dinner take a break from your day, and this little bundle of fur will be bouncing off the walls. Your patience has worn thin, and therefore it is very easy to teach the puppies the wrong thing. 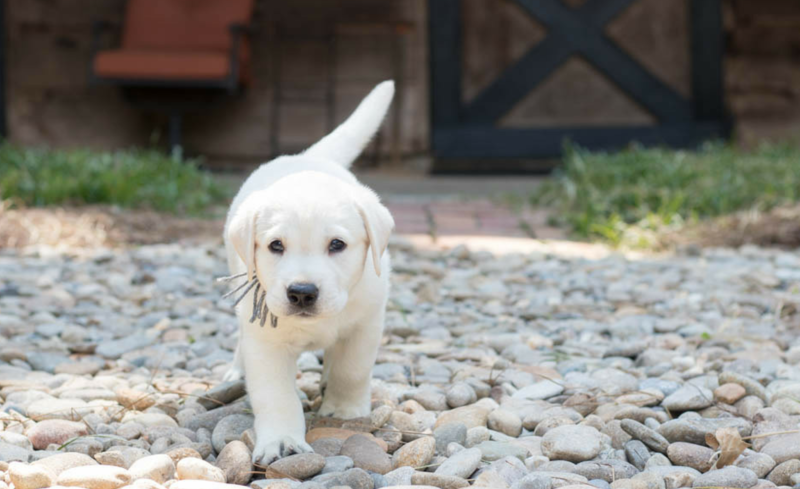 These are just a few things to consider, if you are thinking about bringing a new puppy home. I didn’t even touch upon the potty and crate training which are the two main areas people fail. Then the jumping and puppy biting. Then they hit to be a teenager. Maybe you are thinking a little more about what you may be about to do, I hope so. Dog ownership is very rewarding, however as with anything rewarding it is work. Dogs are not like a television that you can control with a remote control. Many try, it is called an e-collar. I do not feel that is training a dog, and I do not support the e-collar. The reason the e-collar works is because it relates to the dog on how they think, black or white. Dog’s don’t think “maybe”, it is either yes or no, on or off, white or black. So with the e-collar it is the pain or startle of the vibration that keeps the dog from doing what they are not supposed to . It would be like telling you to place your hand on the hot burner of the stove, you get burned, but guess what you won’t do it again. If you have really thought about all I have said and feel you are ready for a puppy, then we are here to help! We will teach you the easiest way to relate to your new puppy so they KNOW what it is you expect. We will send you the best tips for potty and crate training your new puppy. We will teach you how to look at training from your puppies perspective.